Clear blue skies give a stunning backdrop to rolling hills dotted with twisty oaks and row after row of vineyard grapes. You have your sunhat on and your fall outfit is on point. It’s a good day. You can’t wait to clink to the future and do some much-needed wine tasting. But … you have kids. Who get bored. Easily. What do you do? 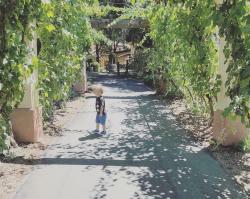 Enter the magic that is the kid-friendly winery. The Central Coast has a bunch of ‘em. 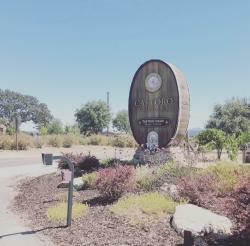 One of our longtime faves is the beautiful Castoro Cellars located just south of Paso Robles, off Highway 46 East, in the rural town of Templeton, California. The hubby and I were treated to all of that plus one ah-mazing cheese platter. Which, I totally recommend getting. Because, since I’m basically a wine tasting extraordinaire now, I know the first rule of Wine Club is you don’t talk about Wine Club. Wait. Or ... is to make sure to eat in between tastings? Let’s go with the eating one. My secret go-to advice is to ask your tasting attendant if outdoor patio wine tasting is available. I can’t say enough good things about how truly wonderful it is to wine taste among the vines as opposed to a sipping in the tasting room. Don’t get me wrong, tasting rooms have their charms and are great for chit-chat. But, if you’re like me, and almost always have kids with you, the act of wine tasting indoors is a whole other ballgame. Like, a crazy alternate-universe ballgame where you are constantly hoping the kids don’t break things. 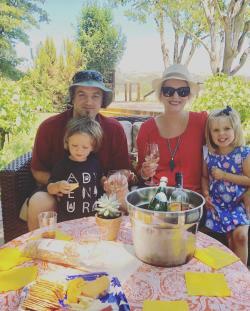 Outdoor wine tasting offers a nice mix of conversion with your attendant, glorious breathing space and distractions galore for the smallest winery-goers. 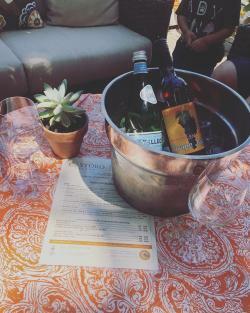 For us, on this particular weekend, our outside oasis provided a chilled steel bucket of Castoro’s finest grape juice for the kids, two wine glasses, a delectable collection of cheeses and charcuterie and one totally addictive bag of the sweet/salty brittle popcorn from Paso Almonds. For the wine tasting, guests are treated to seven tastes for $10, and usually the chance to revisit your faves. I tend to stick to whites, which makes me somewhat of a wine country outlier in Paso’s full-bodied, red wine-loving crowd. But hubby enjoys the reds, so we got to try a little bit of everything. 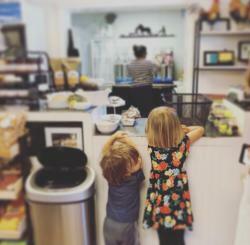 To top off our experience, the kiddos felt quite special having their own grown-up-looking beverage on hand as well. 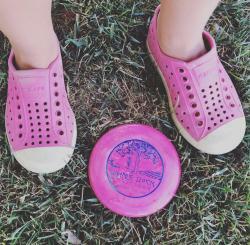 They wrapped their pudgy toddler hands around plastic cups to take some sips but before we knew it, they were off to enjoy a wild childhood run on the grass. Perfection. Then, 4.7 miles west, you’ll find your next stop: the picturesque Jack Creek Farms. 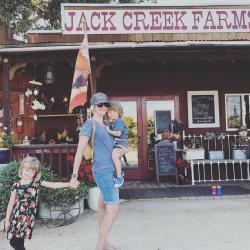 Now that you have done some wine tasting, why not continue your newfound connection to the North County’s laidback country life at another local staple: Jack Creek Farms. Large picnic area with tables – pack your own lunch beforehand! Open year-round, this working farm is a Barlogio family endeavor that dates back to humble beginnings. These sweet folks have put decades of work into their land. 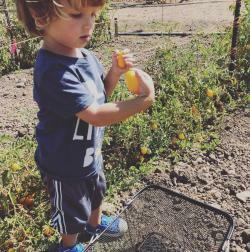 I mean, where else can you find a family-owned establishment that treks out to the fields to handpick the best three tomatoes they can find for the elderly neighbor who just called in a pickup? Adorable! A true, homegrown service. 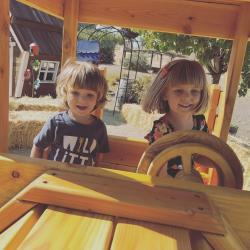 And, not to mention, they’ve put a lot of time and effort into making it kid-friendly with fenced-in play areas and a thoughtful layout that includes a wooden train and haystack pyramid for kids to climb. 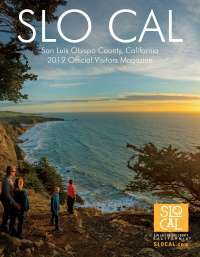 For our SLO CAL excursion: we took it all in. 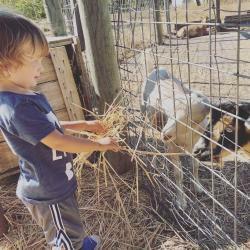 We stayed busy by visiting baby ducks and sweet farm cats, tasting local honey, splitting an apple cider slushie until we got a brain freeze, chatting up some happy goats, and, finally, picking fresh tomatoes (and yellow onions!) straight from the field. And, you can’t forget pumpkins each fall! 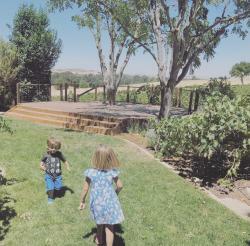 When we went, we were greeted by the family and given all the how-tos of navigating the property. 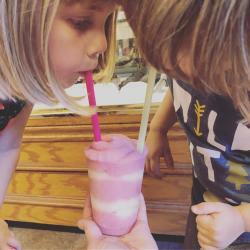 After the kids enjoy all the outside fun, we recommend heading into the gift shop to find a cider slushie and pomegranate and berry blend granitas (a few bucks), fresh and local honey tasting (free) from teeny tiny spoons and perhaps mom can grab a farmhouse kitchen trinket or two. 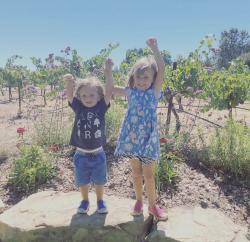 And that’s a wrap on how to have a lovely, family-friendly day by winetasting & doing a farm outing in Northern SLO CAL!